What are the best RV washer and dryers in 2019? If you want to straight-up know what is the RV washer and dryer that best suits most needs, our choice would be the Giantex Portable Mini. 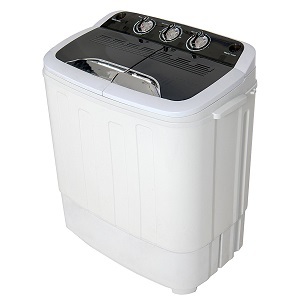 After going through the best RV washer and dryer reviews we could find, this product came on top thanks to its relatively high washing capacity of 11lbs. This might not seem all that impressive, but for a portable unit that can easily fit in a small camper, it’s quite a lot. This makes for great convenience since you won’t have to repeat the washing cycle quite as many times as you would with a less “roomy” unit. The Giantex Mini is also surprisingly affordable and easy to operate, requiring no extra provisions to install in an average trailer. If for some reason our top pick isn’t available, you can go for the Do mini XPB36-1288s, an equally reliable washer that’s also small enough to fit snugly anywhere inside a camper. Access to your own washer and dryer on a camping trip will spare you the hassle of having to search for a public laundromat in a foreign place. Convenience should thus be a given, but what other things are worth to have in mind when looking for the best washer and dryer for RV us? There are three types of RV washer and dryers to choose from, all of them equally popular and made to fit specific needs. Stackable models are relatively large and quite heavy, although the fact that the dryer sits on top of a front-fed washer somewhat saves space. Their load is similar to that of a home unit, and they generally have their own venting capabilities. They are however as expensive and energy demanding as home units. The same can be said for the washer dryer combo, with the added downside of not allowing you to wash and dry at the same time. 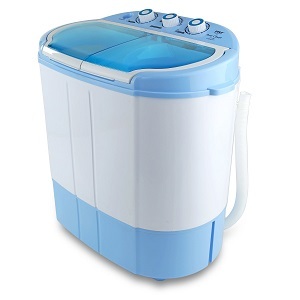 Small portable units best fit the model of a “part-time” washing machine. Unpretentious in regards to costs and with a very good wash load for their size (thanks to the vertical feed) they will make a great addition to smaller, less pretentious RVs. This is the most important aspect that one has to have in mind when it comes to convenience. Smaller units take less room inside a crowded camper, and you don’t need us to tell you how much more comfortable extra space would make your life on the road. Portability also comes into play, because being able to get your washer and dryer out on the camping site means you won’t have to negotiate narrow spaces while handling the laundry. An often overlooked factor of size is energy consumption, with smaller units generally performing better. This detail is especially important when you attempt to connect to a crowded camping site’s electrical outlets since these can easily overload. Don’t expect to have the same washing capacity on the road as you would back home, although some models might come close to achieving this. However, a high capacity can make the difference between having to spend half the day going through your vacation wardrobe or just a couple of hours. The thing to look for here is the best compromise between washing capacity and the total size of the unit, with top fed machines and washer dryer combos coming off a little better than the rest. Right down to the oxymoronic name, bound to cause a chuckle, the Giantex Mini is a lovely little unit. 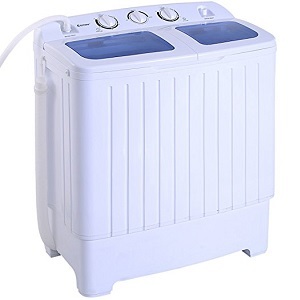 With nearly 11lbs of washing capacity and 5lbs for the dryer, this portable top fed washing machine can even compare well with items that are in an altogether different weight class. Good capacity translates into less time you will have to spend washing and drying. Even so, a single cycle lasts as little as 20 minutes washing and 15 minutes drying. Portable units are well appreciated for their speed, and the Giantex Mini is no exception. While its inlet pipe is not exactly sizable at 43”, you can easily fill its washer with a bucket or a hose if you intend to use it outdoors. The low voltage of 110V/60Hz makes this model friendly both to the environment and to the electrical wiring. To boot, it also comes at a very low purchasing price. Do mini specializes in designing and building small sized house appliances, and as such, we would expect for their RV washer and dryer line to be well suited for this purpose. They went with a portable top loading design for the 1288s, which confers a lot of advantages when it comes to storage, portability and water and power usage. This unit weighs in at just 28 lbs and its base measures 14X23.2 inches while its height is 26.5 inches, which will make it fit well in any medium sized RV. With 110 volts at 60 Hz of power consumption, it won’t put a strain on even the flimsiest electrical wiring. 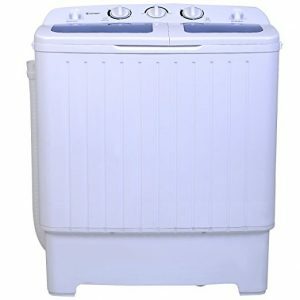 It has a medium capacity for its class, with the washer being able to handle 8.3 pounds with 4.7 pounds in the spinner. Again, a low cycle time of around 20 minutes makes this better than it sounds, and the 1288s further alleviates its low capacity with an interesting feature. Both the washer and dryer can be programmed to work simultaneously, sparing you a lot of time. This small Pyle unit is particularly easy to store and carry around. Weighing in at around 22lbs it won’t give much trouble even for diminutive women to get out of the RV and into the camping place. Thanks to its remarkably low voltage, of just 120, it won’t put much of a strain on any type of wiring, removing any worries of the fuses turning while you try to watch TV or use the microwave. The washing capacity of 7.7lbs is not really something to write home about, but the short washing and drying cycles somewhat make up for it. Again, it’s always a trade-off between capacity and the machine’s overall size, with the people at Pyle firmly going for storage and portability. This unit will prove ideal for more compact RV’s or for people that just appreciate having a lot of space to move around in their camper.